Home NEWS POSTS Codemint announces political science research materials open for crowdsourcing. Again, Codemint, a student’s research website has announced Political Science research topics and materials open for crowdsourcing. This resolution followed the company’s agenda to leverage the creativity and intellectual resources of clients to improve their services to students. Moreso, they seem to grab this chance to make their clients stakeholders in the same company they seek services from. “To bridge the communication gap between codemint and our clients, crowdsourcing is a tool we have deployed to achieve this purpose” explained Kachi Grace, a communication strategist at codemint”. “ So while we encourage creativity and flexibility for our services through crowdsourcing political science research papers, we also propose to extend adequate reward, recognition, satisfaction and censored freedom to as many who will contribute to this agendum”. 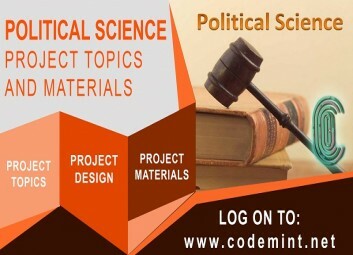 To view current research topics in political science on codemint, please visit http://codemint.net/political-science/political-science-project-topics . Students who wish to join the codemint’s ‘sell your project plan’, should please visit http://codemint.net/sell-your-project-materials-and-source-codes?a=SP to join. Why has codemint proposed to crowdsource? As earlier highlighted, the entire idea is to leverage the creativity, skills, ideas, research and participation of clients to generate reasonable research topics and materials on codemint. The company seems to realize the diversified nature of their service which entails, providing project and other research materials to students of various academic institutions who also have varying guidelines for the presentation of their research work. Crowdsourcing political science projects will not only help codemint serve their clients better, they also want to make clients get actively involved in the company they get services from and in extension become stakeholders to the company. Other department sure as business management project topics https://codemint.net/management/management-project-topics and biology project topics https://codemint.net/biology/biology-project-topics are also open for crowdsourcing. Who does codemint intend to crowdsource from? Basically, codemint is out to provide services to final year students who constitute over 95% of their clients. Therefore, it is expected that ex-final year students, so to say, who already are done with their tertiary education can crowdsource for codemint. Moreso, academic research specialists are not left out in this research plan. As much as they can, codemint expects their inputs towards providing reasonable research materials for final year students. What benefits do they stand to gain by crowdsourcing political science project materials for codemint? Prospective partners in this plan should expect to gain recurring revenue, recognition and exposure to a lot of other opportunities which codemint provides. Is this new research plan only limited to political science research materials? Not entirely, other academic departments as well as political science are available. As a matter of fact, codemint needs every significant intellectual contribution you have to make. Political science and any other department is open for crowdsourcing. How does codemint intend to manage research materials from so many sources? As much floor is open for crowdsourcing, codemint has always embraced a work culture to censor what comes in and goes out from their website in form of contents and services. They do not intend to accept just any kind of research work; it has to pass through rigorous screening before it is uploaded to our website. Intending members are therefore advised to treat this offer with every leap of honesty sincerity as codemint is dedicated to reward every of your effort.